The Joe Rogan Experience Podcast is headquartered in a 14,000 square foot warehouse but the actual podcast studio is nowhere near that size. Joe Rogan used some of that extra space to build a private strength and conditioning gym with a combat sports section for kickboxing and jiu-jitsu. The JRE studio gym has all of the equipment you’d need or want in a commercial gym. It even looks the part with mirrored walls, rubber flooring, high ceilings and proper lighting. 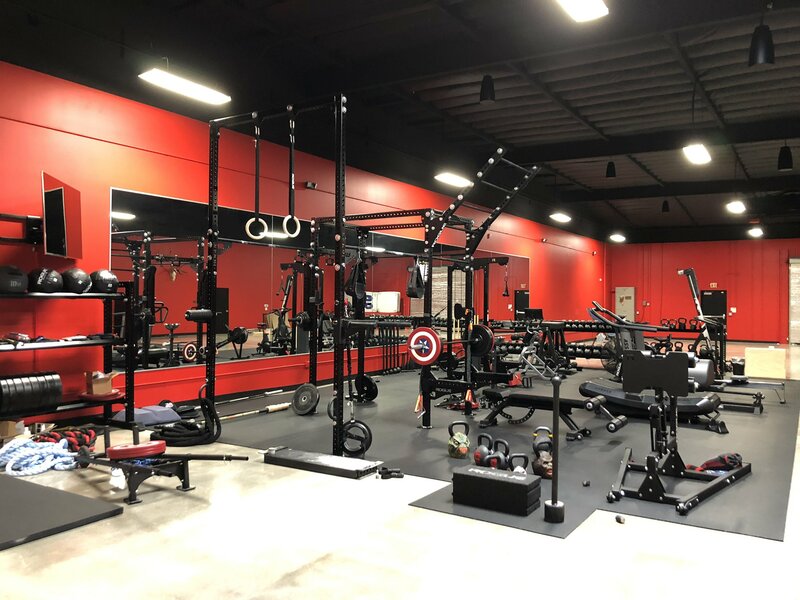 The strength and conditioning side of the JRE gym was set up by Rogue Fitness, a manufacturer of high quality, American-made fitness equipment. Rogan says he’s been buying Rogue’s stuff for years and he even had them set up his home gym. Other pieces of equipment have since been added to the gym and a lot of the free weights are from Onnit. The combat sports side of the gym was set up by Fuji Mats with floor mats, heavy bags and a bag rack system. All of the fitness equipment, machines, devices and accessories in the JRE studio gym are listed below and most can be seen in this photo. One piece of fitness equipment that Joe Rogan frequently talks about is the Iron Neck. He’s a big believer in working out your neck and the Iron Neck is the best neck resistance training method he’s found. It can be used for neck strengthening as well as for injury prevention and rehab for neck/back pain. Rogan loves the Iron Neck so much he has one for the studio gym and another for his home gym. He says every grappler should get one. The Reverse Hyper Machine is another piece of fitness equipment that Joe Rogan loves to tell podcast guests about and always offers to demonstrate how it works. It was invented by Louie Simmons of Westside Barbell, a guest on JRE #854. The Rogue RH-2 Reverse Hyper is a stand-alone machine that is loaded with barbell plates. It strengthens the lower back on the way up and decompresses the spine on the way down. Rogan swears it worked wonders for his own back issues. Compound movements engage multiple muscle groups and are an essential part of strength and hypertrophy training. The Rogue Monster Rig is where Rogan performs compound lifts like squat, bench press, overhead press as well as pull-ups, chin-ups, dips and more. He easily could have used a Rogue Monster Power Rack instead of a rig. But the rig provides a bit more versatility, spreads out the accessories/attachments, and provides a place for the gymnastic rings to hang. Rogan is using a number of Rogue accessories and attachments with the Monster Rig as shown in his Instagram photos above. The rig’s main rack has a Monster Flying Pull-Up Bar attachment for doing chin-ups, pull-ups, muscle-ups and ladders. When squatting or benching heavy, the Safety Spotter Arms can catch the barbell if necessary. The Rogue Monster Utility Seat works with the Safety Spotter Arms to create a platform for box squats, Bulgarian squats, step ups, etc. The Rogue Monster Lever Arms are multi-grip jammer arms for performing explosive upper-body movements. The secondary pair of uprights has an Extension Kit and a number of other attachments. The added height of the extension is for hanging Rogue Gymnastic Wood Rings (also available from Onnit). A Monster Matador Dip Extension allows for tricep dips and chest dips. There are two Monster Rope Attachment Anchors for use with the Rogue Bulldog Ropes and Onnit Battle Ropes. A Rack Mounted Leg Roller is also attached for stretching, one-leg squats, Bulgarian squats and more. There are hanging ab straps for doing ab exercises like knee and leg raises. The Iron Neck is also set up here. You can do a ton of exercises with just a barbell or dumbbells and an adjustable weight bench. Rogan has the Rogue AB-3 Bench. It’s compact and solid bench made of 11-gauge steel. The seat and back pad are adjustable and can be set to a decline position with a removable foot catch. It has wheels so it can be easily moved around the gym. Heavy dumbbells are a must for any gym. Rogan has a complete set of Rogue Rubber Hex Dumbbells with pairs ranging in weight from 5 to 125lbs. The rubber casing limits noise and protects both the dumbbells and the flooring from wear and tear. The dumbbells are stored on a Rogue storage rack. Kettlebells have been a staple of Joe Rogan’s strength and conditioning routine for years. He says they’re one of the best tools for developing functional strength which translates to improved athletic performance especially in jiu-jitsu. He’s a big fan of using kettlebells for cardio workouts and has frequently endorsed Keith Weber’s Extreme Kettlebell Cardio DVD. The JRE studio gym has a set of Rogue Competition Kettlebells in pairs. They are stored on a Rogue storage rack dedicated to kettlebells. These 3D sculpted iron kettlebells not only look super cool but they’re also perfectly balanced. Onnit Primal Bells are available as the Howler (18lbs), Chimp (36lbs), Orangutan (54lbs), Gorilla (72lbs) and Bigfoot (90lbs). Rogan likes to go heavy with the Gorilla bells for cleans, presses and squats. He had some of them custom painted by artist @3sheets to look like Planet of the Apes war paint. The Ohio Bar is a high quality multi-purpose barbell and Rogue’s most popular bar. Rogan has multiple barbells as the Monster Rig can have concurrent squat, bench or other rack setups. The Ohio Bar weighs 20kg (44lbs) and has a lifetime guarantee against bending. Rogan uses a Rogue trap bar for shurgs and deadlifts. Deadlifting with a trap bar is safer as it puts less stress on the spine and lifters can generate more power than with a standard barbell. Rogan appears to be doing Oscillating Kinetic Energy training using the BandBell E-Maxx Bar. It’s a lightweight and bendable barbell with grooves for resistance bands or hanging weights. Performing exercises with this type of barbell creates instability and activates the stabilizing muscles. The JRE gym has a set of Rogue bumper plates for doing squats, bench press, overhead press, and deadlifts with a barbell. The plates are also used with the reverse hyper machine, T-bar row, and War Wagon. Rogue sells individual bumper plates at 10, 15, 25, 35, 45 and 55lbs as well as sets at various total weights including 160, 230, 260, 350, 500 or 1000lbs. The barbell plates are stored on the Rogue 3-Tier Mass Storage System (70″). Onnit’s collaboration with Marvel produced these flashy barbell plates that look like Captain America’s shield. Made from polyurethane with steel centers and thin profiles, these bumper plates come in 25, 35 and 45lbs. They are available as individual plates, as pairs of plates or as a 210lb set (2×25, 2×35, 2×45). Swinging clubs is an ancient Persian training method used by soldiers and wrestlers for strength and conditioning. The uneven weight distribution of the steel club works the stabilizer muscles and improves balance and shoulder mobility while increasing shoulder strength, grip strength and rotational core power. Exercises can be performed using a single club or with a pair of clubs. Rogan has the full set of Onnit Steel Clubs in pairs of 5, 10, 15, 20, 25, 35 and 45lbs. Like the clubs, mace training comes from ancient Persia and can be used for full body workouts with movements that aren’t possible with conventional fitness equipment. The steel mace has a more extreme weight displacement than the steel club with most of its weight in a ball at the end of a long shaft. Swinging a steel mace works the stabilizer muscles and improves core strength and rotational core power. Rogan has the full set of Onnit Steel Maces at 7, 10, 15, 20, and 25lbs. The JRE gym also has a pair of Onnit Quad Maces. Each Quad Mace weighs 25lbs and has a slip-resistant ash wood handle that is longer than the steel mace handle. The mace head is made of cast iron. Medicine ball training is another ancient form of strength and conditioning used to increase explosive power and core strength. There are a number of exercises you can do with medicine balls including throwing and catching, sit ups, twists, squats, presses and more. Rogue medicine balls are not suitable for slams. Rogan has Rogue’s 10, 14 and 20lb medicine balls. They are stored on the Rogue 3-Tier Mass Storage System (70″). Onnit’s high quality medicine balls are made with ballistic-grade material and designed for slams in addition to wall ball throws, catches, sit ups, twists, squats, presses, etc. They are built to retain their spherical shape with heavy use. The surface material is super grippy. They’re available in 10, 15 and 20lbs. The glute-ham raise (GHR) is one of the best exercises for strengthening the hamstrings and glutes especially for athletes. It can even help prevent hamstring pulls and strains. Rogan performs his GHRs on the Rogue Abram GHD 2.0. The high pulley/low pulley is a versatile machine that allows Rogan to do seated lat pulldowns, standing tricep pushdowns, low rows from the floor, cable crunches and more. The Rogue Monster Lat Pull Down/Low Row is a freestanding machine with a 300lb weight stack in 10lb increments. It comes with a stainless steel lat bar but other grips are also available. Rogan has the Rogue Monster Grip Triangle and the Rogue Tricep Push Down Attachment. The T-Bar Row is a simple machine dedicated to back rows. The front post is loaded with barbell plates. It has multi-grip handle which allows for wide or narrow grip rows. The cardio section of the JRE studio gym is where Joe Rogan worked out like a psycho for Sober October 2 and destroyed the competition. The gym has a good variety of different cardio machines including an air bike, climber, rower and manual treadmill. Any one of these machines is capable of delivering a punishing workout. For Sober October 2, Joe Rogan, Bert Kreischer, Tom Segura and Ari Shaffir each wore a Myzone MZ-3 Activity Belt to monitor their heart rates, log their fitness activity and keep score. Air bikes use a giant fan for resistance and provide a full body workout as they require pedalling with your legs in combination with moving your arms. The overbuilt Rogue Echo Bike is solid and sturdy with a belt-driven steel fan that produces a smooth and quiet ride. Rogan loves to push himself hard on the bike doing Tabata rounds (20 seconds of max effort followed by 10 seconds of rest). Vertical cardio training uses your arms and legs to step and climb with a push and pull action. It provides a zero impact, full body workout with a high calorie burn rate. The VersaClimber LX is a commercial grade machine with adjustable resistance. Rowing is another low impact, full body cardio exercise that Rogan loves to do. The Concept2 Rower is the world’s best-selling rowing machine. It uses a flywheel to provide air resistance which can be adjusted. Here’s Ari Shaffir using the Model D.
Running on a manual treadmill is much more difficult than running on a motorized one and it even burns more calories. A manual treadmill is powered by the runner’s own movement and provides a more natural running feel. Rogan’s gym has the Assault Fitness AirRunner. Hanging upside down with an inversion table is a great way to decompress the spine and relieve back pain. Rogan has been using Teeter inversion tables for 20+ years to keep his back healthy. The studio gym has a Teeter EP-560 Ltd and it has become part of Rogan’s daily routine. He says he uses the gravity boots to do sit ups. A decompression and extension machine is a multi-purpose alternative to the inversion table. The Teeter Dex II can be used to do hip-supported inversions to decompress the spine. It can also be used for back extensions, stretching, crunches, and inverted twists as well as dips and push-ups with the upper and lower handles. The wood plyo box is for doing box jumps and step ups. The Rogue Games Box is like having 3 plyo boxes in 1 with different heights of 20″, 24″ or 30″ depending on the orientation of the box. A firm grip is important when lifting heavy. Using chalk on the hands will absorb any sweat and ensure a secure grip on a barbell or handle. The Rogue Chalk Stand is on wheels and can be moved around where needed. UFC fighter Matt Brown dropped by the JRE studio to deliver some fitness equipment from his company, Immortal Combat Equipment. The War Wagon is a standard weighted wheel barrow with an interchangeable handle system. The Battle Hammer is a sport specific sledgehammer that is better designed and more durable than the hardware store sledgehammers typically used for training. It features a cylindrical head with a flat top. A ball at the opposite end of the shaft prevents the hammer from slipping out of your hands. They are available from 15 to 35lbs. Rogan appears to be using the Rogue Ballistic Block as a sledgehammer target instead of a rubber tire although Rogue says it’s not intended to be hit with a sledgehammer. The combat sports area is right beside the strength and conditioning gym, giving Rogan a proper space to roll and train Brazilian jiu-jitsu, practice striking, and hit pads with JRE MMA Show guests. The flooring uses Fuji Mats Tatami Series mats which have some texture for grip. He previously used the Smooth Series mats also by Fuji Mats but found they were too slippery for kicking. The wall pads are customized with the Joe Rogan Experience logo. Rogan has a variety of heavy bags including a Fuji Muay Thai Bag, Fairtex Banana Bag, Monster Energy Bag, Fuji Teardrop Bag, and Fuji Wrecking Ball Bag. The heavy bags are mounted using a Fuji Trolley Bag Rack System. Rogan also has a PowerKube to measure the force of his kicks and punches. There’s even a wall-mounted TV so he can watch fights as he trains.